Kabat-Zinn is the founder of Mindfulness-Based Stress Reduction (MBSR) and the founding executive director of the Center for Mindfulness in Medicine, Health Care, and Society at the University of Massachusetts Medical School. Jon Kabat-Zinn, Ph.D., is a scientist, writer, and meditation teacher. He is Professor of Medicine emeritus at the University of Massachusetts Medical School, where he was founding executive director of the Center for Mindfulness in Medicine, Health Care, and Society (1995), and founder (in 1979) and former director of its world-renowned Mindfulness-Based Stress Reduction (MBSR) Clinic. He is the author of Full Catastrophe Living: Using the Wisdom of Your Body and Mind to Face Stress, Pain and Illness (Dell, 1990, 2005, 2013), Wherever You Go, There You Are: Mindfulness Meditation in Everyday Life (Hyperion, 1994, 2005), Everyday Blessings: The Inner Work of Mindful Parenting (co-authored with Myla Kabat-Zinn; Hyperion, 1997, 2014), and Coming to Our Senses: Healing Ourselves and the World Through Mindfulness (Hyperion, 2005). 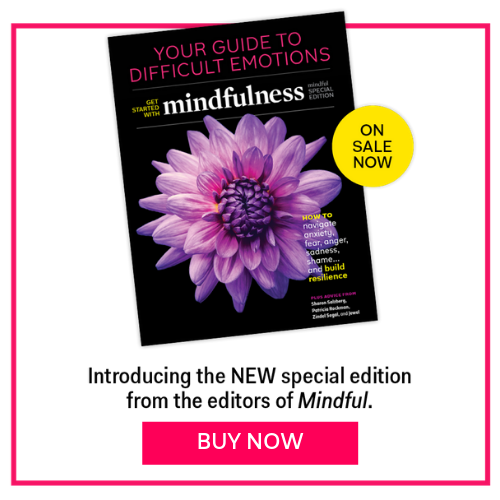 He is also co-author, with Williams, Teasdale, and Segal, of The Mindful Way Through Depression: Freeing Yourself from Chronic Unhappiness (Guilford, 2007); author of Arriving At Your Own Door: 108 Lessons in Mindfulness (Hyperion, 2007); Letting Everything Become Your Teacher (Random House, 2009); The Mind’s Own Physician: A Scientific Dialogue with the Dalai Lama on the Healing Power of Meditation (editor, with Richard Davidson; New Harbinger, 2011); Mindfulness for Beginners: Reclaiming the Present Moment and Your Life (Sounds True, 2012); and Mindfulness: Diverse Perspectives on its Meaning, Origins, and Applications (editor, with Mark Williams; Routledge, 2013). His books are published in over 30 languages. Dr. Kabat-Zinn received his Ph.D. in molecular biology from MIT in 1971 in the laboratory of Nobel Laureate, Salvador Luria. His research career focused on mind/body interactions for healing and on the clinical applications of mindfulness meditation training for people with chronic pain and stress-related disorders, including a work-site study of the effects of mindfulness-based stress reduction (MBSR) on the brain and how it processes emotions, particularly under stress, and on the immune system (in collaboration with Dr. Richard Davidson). Dr. Kabat-Zinn’s work has contributed to a growing movement of mindfulness into mainstream institutions such as medicine, psychology, health care, schools, corporations, prisons, and professional sports. Hospitals and medical centers around the world now offer clinical programs based on training in mindfulness and MBSR. Dr. Kabat-Zinn has received numerous awards over the span of his career. He is a founding fellow of the Fetzer Institute, and a fellow of the Society of Behavioral Medicine. He received the Art, Science, and Soul of Healing Award from the Institute for Health and Healing, California Pacific Medical Center in San Francisco (1998); the 2nd Annual Trailblazer Award for “pioneering work in the field of integrative medicine” from the Scripps Center for Integrative Medicine in La Jolla, California (2001); the Distinguished Friend Award from the Association for Behavioral and Cognitive Therapies (2005); an Inaugural Pioneer in Integrative Medicine Award from the Bravewell Philanthropic Collaborative for Integrative Medicine (2007); the 2008 Mind and Brain Prize from the Center for Cognitive Science, University of Torino, Italy; and a Pioneer in Western Socially Engaged Buddhism Award (2010) from the Zen Peacemakers Association. He is the founding convener of the Consortium of Academic Health Centers for Integrative Medicine (CAHCIM), and a member of the Board of the Mind and Life Institute, a group that organizes dialogues between the Dalai Lama and Western scientists to promote deeper understanding of different ways of knowing and probing the nature of mind, emotions, and reality. He and his wife, Myla Kabat-Zinn, are engaged in supporting initiatives to further mindfulness in K-12 education and to promote mindful parenting.